Not to be confused with Stewart-Haas Racing, Haas F1 Team, Haas Lola, Carl A. Haas Motorsports, or Haas Automation. During the 1980s, and for the better part of the 1990s, the team was closely aligned with the Andretti family. 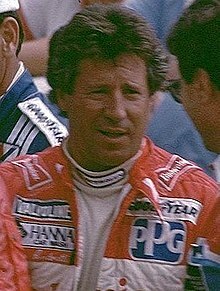 In 1983, Mario Andretti signed as the primary driver, an arrangement that would carry him through the remainder of his career, until his retirement in 1994. Michael Andretti joined the team in 1989–1992 and again in 1995–2000. Both Mario and Michael won a CART championship driving for the team. Newman/Haas was also the team for which Nigel Mansell competed in CART, winning the 1993 title. Despite their many years of success in Indy car racing, and its status as an elite team in the sport, the team never achieved a victory of any sort at the Indianapolis 500. Reflecting on the perceived Andretti curse, the team's best finishes were second places by Mario Andretti (1985) and by Michael Andretti in (1991). From 2007 to 2010 Mike Lanigan became a partner in the company, and the team became known during that time as Newman/Haas/Lanigan Racing. After the 2011 season, Carl Haas announced that the team would not run in the IndyCar Series in 2012 due to the economic climate. Lanigan became a part owner of Rahal Letterman Lanigan Racing. The team closed its doors and sold off its equipment. Haas died in 2016, while Newman had died in 2008. Newman/Haas was one of the most successful teams in the history of CART, its drivers winning eight championships and over 100 individual races. The team's drivers over the years included Mario Andretti, Michael Andretti, Nigel Mansell, Paul Tracy, Cristiano da Matta, Sébastien Bourdais, Justin Wilson, and Graham Rahal. At its inception, the team was a single-car outfit, with championship veteran Mario Andretti, the 1978 Formula One World Champion, hired as lead driver. Team co-owner Carl Haas brought in Lola as chassis manufacturer for the team, re-introducing the constructor to the sport. Haas spearheaded Lola's first full-time, full-scale assault on the Indy car market, and the car was quickly picked up by other teams. By the end of the decade, Lola would be one of dominating chassis manufacturers in the paddock, displacing March. Andretti won two races in 1983, and finished a strong third in points for the first-year team. In 1984, Andretti won six races, nine poles, and scored a total of 10 top-ten finishes to win Newman/Haas's first CART season championship. In 1985, Andretti started off with three wins and one second place in the first four races of the season. He became mired in a mid-season slump, and later suffered a broken collarbone, dropping him to fifth in points at the end of the season. While Andretti recovered from injury, 1980 F1 World Champion Alan Jones drove one race in substitution finishing 3rd at Road America. Andretti's second place at the 1985 Indianapolis 500 would tie for the team's best result in that event, but was widely overshadowed as a highly disappointing defeat. Andretti lost the race to Danny Sullivan. In 1986, Andretti suffered a crash during practice at Indianapolis, forcing him to start in a back-up car. He dropped out and finished 32nd. Andretti went on to win two races, and finished 5th in points. For 1987, the team switched to the Ilmor Chevy Indy V-8 powerplant. Andretti won the season opener at Long Beach, the powerplant's first Indy car victory. Andretti won one other race, but suffered more disappointment than success, including another heartbreaking loss at Indy. Newman/Haas expanded to a two-car team starting in 1989, adding Michael Andretti. The father and son duo of Mario and Michael Andretti excelled as one of the top teams on the Indy car circuit over the next few years. In their first season as teammates, father and son finished 6th and 3rd in points, respectively. Michael Andretti won the 1991 CART championship, and finished second in points in 1990 and 1992. Starting in 1992, the team switched to the new Ford Cosworth XB engine. Despite consistent success on the CART circuit, both Mario and Michael still failed to achieve victory for Newman/Haas at the Indy 500. Michael finished second in 1991, and dropped out while leading with 11 laps to go in 1992. Nigel Mansell driving for the team in 1993. Michael Andretti left the team to pursue an opportunity in Formula One for 1993 and was replaced by English driver Nigel Mansell, who arrived on the CART circuit with much fanfare. In his rookie season, Mansell, the 1992 Formula One World Champion, won five races and had ten top-3 finishes, clinching the 1993 CART title to become the only driver in history to hold both the Formula One and Champ Car titles at the same time. Mario Andretti also returned to victory lane, winning what would be his final Indy car victory at Phoenix. Both Mansell and Andretti were strong contenders at Indy, but Andretti slipped to 5th due to a penalty, and Mansell, still largely unfamiliar with rolling re-starts after a safety car period (safety cars would not be introduced into F1 until 1993), was passed for the lead on a restart with only 16 laps to go and would ultimately finish 3rd behind winner Emerson Fittipaldi and second placed Arie Luyendyk. The 1994 season much was more maligned for the team. While Mario Andretti was in his much-celebrated retirement year, he scored no wins and only three top five finishes. Mansell slumped as well, scoring no wins, and eventually left Indy cars at season's end to return to Formula One. Both Mario and Mansell had miserable results at Indianapolis in 1994. Mario dropped out and finished 32nd in his final Indy 500 after only 23 laps due to a fuel system failure. Mansell was later knocked out of the race in a bizarre crash with Dennis Vitolo. Michael Andretti and Christian Fittipaldi represented the team together for five season, with Roberto Moreno driving as an occasional substitute. Andretti won ten races during this period, finishing second in points in 1996, and continued to remain a top driver on the circuit. Fittipaldi scored two wins, and a best finish of 5th in points in 1996. In 1997–1999, the team utilized the Swift chassis, but it did not prove to be very successful. The team went back to Lola in 2000. Andretti parted ways with Newman/Haas after the 2000 season, in part due to the team's refusal to enter a car at Indianapolis of the rival Indy Racing League. Andretti joined Team Green for 2001, and eventually bought into the team, which is now known as Andretti Autosport. Bourdais won four Champ Car titles with the team. Though many CART-based teams had switched over to the Indy Racing League by 2003, Newman/Haas remained in CART and later the Champ Car World Series. Sébastien Bourdais would dominate the series over the next several years, winning 31 races, 31 poles, and four consecutive Champ Car championship titles. In 2005, Newman/Haas Racing fielded two cars in Champ Car. The drivers were Bruno Junqueira and Sébastien Bourdais, the eventual champion. Junqueira was injured in a crash during the 2005 Indianapolis 500, however, and was replaced in the cockpit by Oriol Servià. For 2006, Newman/Haas Racing again fielded two cars. The cars were upgraded Lola B03-00 chassis, powered by Ford Cosworth engines with Bridgestone tires. The drivers were Sébastien Bourdais and Bruno Junqueira. Newman/Haas earned its milestone 100th CART Indy car series win on June 10, 2007 when Sébastian Bourdais won at Portland. Though several CART-based teams had returned to the Indianapolis 500 beginning in 2000, Newman/Haas resisted a return to the race until 2004. While maintaining a full-time effort in Champ Car, the team entered singly at Indy with driver Bruno Junqueira. He was leading the race on lap 150, hoping to stretch his fuel and be leading the race when impending rain arrived – which could have given him the race victory. He was forced to pit, and finished 5th when the race was called on lap 180. In the team's second post-"split" attempt at the Indy 500, both team drivers Bruno Junqueira and Sébastien Bourdais were factors early on, but both drivers crashed out. The team would skip the 2006 and 2007 Indy 500 races. In the wake of the 2008 open wheel unification, the team transitioned from the Champ Car World Series to the IndyCar Series full-time. The team retained the services of drivers Justin Wilson and Graham Rahal. Like many of the transitional teams, Newman/Haas experienced mixed results getting up to speed compared to some of the established IndyCar counterparts, but did achieve two victories during the course of the season. Justin Wilson led much of the race at St. Petersburg, and Graham Rahal ended up winning the race. At the final Champ Car race at Long Beach, both cars dropped out. A month later, both cars crashed out at the Indianapolis 500. Late in the season Wilson won the race at Detroit, just weeks before the death of team co-owner Paul Newman. It was the team's 107th and final win in Indy car racing. Graham Rahal returned, but Justin Wilson was replaced by former Champ Car driver Robert Doornbos. Milka Duno tested a third car during the offseason, but a ride never materialized. Doornbos left the team in early August, and Oriol Servià finished out the season in the car. Unable to find sponsorship at the beginning of the season, Graham Rahal was released, and the team began the season with only one entry for Hideki Mutoh. Rahal rejoined the team later in the season at Toronto, finishing 5th. Rahal found sponsorship for five additional races. The team began the season with one car, driven by Oriol Servià. Prior to the second race of the season, James Hinchcliffe was added as a second driver for selected events, including Indianapolis. The team initially planned to run the full 2012 season, going as far as purchasing two Dallara DW12 chassis. However, before the season started, the team announced that they would not compete due to lack of sponsorship. After briefly entertaining a one-off entry for Jean Alesi at Indianapolis, they withdrew and sold off their cars to Fan Force United. A return in 2013 failed to materialize, and the team formally disbanded. ^ Race run to Champ Car specifications. ^ Cavin, Curt (December 26, 2011). "Farewell, Champions". AutoWeek. 61 (26): 80. ^ INDYCAR: Newman/Haas Working On Two-Car Return In 2013 Marshall Pruett for speedtv.com, May 03, 2012.